Alexis Sanchez has been on fire lately. in flames. You know he would. Arsenal could really use a little momentum right now; just look at their upcoming fixture list: Watford away tomorrow, Bayern at the Emirates on Tuesday, Everton at home next weekend, a cup tie at Sheffield Wednesday, the always tricky Swansea away, Bayern away in the reverse fixture, and then Spurs at home. That's two games per week from now until the November international break. Arsenal had some momentum of course, when they stormed Manchester United out of the gate two weeks ago, leading 3-0 inside of 20 minutes. Then, the international break cooled some of that momentum. It should be noted, however, that many Arsenal players put in some excellent shifts for their national sides: Alexis Sanchez scored three while hurt, Santi Cazorla had two for Spain, Olivier Giroud had two for France, Joel Campbell tallied, Theo Walcott and Alex Oxlade-Chamberlain scored in separate England games, Aaron Ramsey scored for Wales, and Mesut Ozil had an assist for Germany. If anything, it seems like Arsenal might still be firing on all cylinders. They'll need to be, because the next three to four weeks look overwhelming. Laurent Koscielny faces a fitness test. So, where were we with injuries before the break? Danny Welbeck, Jack Wilshere, and Tomas Rosicky are out long-term. Laurent Koscielny missed the United game and France duty with a hamstring injury. Alexis picked up an adductor injury against United, then played 100,000 minutes for Chile. Our aging holding midfielders were both out nursing knocks. So, where are we now? Not very far away from there. Laurent Koscielny faces a fitness test. Mikel Arteta and Mathieu Flamini are both expected to be available for selection. Alexis Sanchez has been referred to as "OK" by Arsene Wenger, though the source on this is, apparently, a text from Alexis Sanchez. I am willing to believe Alexis would text Wenger he was fine while actively fighting an alligator if it meant he would selected to start a football match. As for the XI, I expect no changes from the side that picked United apart, unless Koscielny passes fit. Arsenal do, of course, have the little manner of Bayern Munich on Tuesday. Predicted XI: Cech, Bellerin, Mertesacker, Gabriel, Monreal, Coquelin, Cazorla, Ozil, Ramsey, Alexis, Walcott. I've never been fond of Behrami's hair. 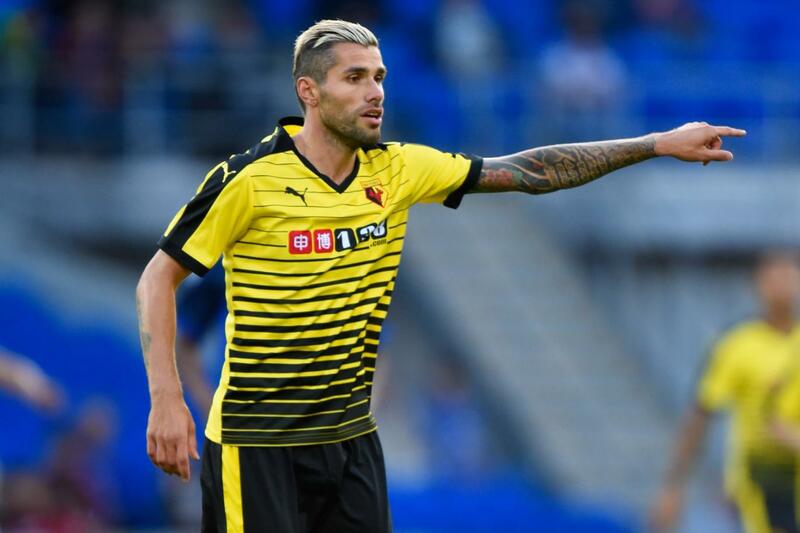 Valon Behrami is back from a three-match suspension after a red card against Swansea City, but his availability is in doubt as he's struggled with a calf strain. The Swiss international did not appear for the national side during this recent international break due to the injury. The Hornets will be without Joel Ekstrand, who is out until at least January with a knee injury. There are Allon Nyom (knee,) Ikechi Anya (calf,) and Jurado (hamstring.) Lloyd Doyley has been out since undergoing neck surgery in May and lacks match fitness. Tactically, Watford defend with a classic set-up of two banks of four, then either break or the wings or pump long balls to the forwards. Right back Allan Nyom is a 50/50 doubt with a knee injury and could be replaced by Juan Carlos Paredes. He could provide more of an offensive threat, along with his opposite wingback Nathan Ake, on loan from Chelsea. The Hornets are anchored in midfield by Etienne Capoue, who will start in the middle along with Behrami, if he's fit, or Ben Watson, who deputized during Behrami's suspension. Predicted XI: Gomes, Nyom, Cathcart, Prodl, Ake, Capoue, Behrami, Anya, Abdi, Deeney, Ighalo. It starts at the zero line. That line on the Y-axis is what I suppose is an average mood. It shoots up after the Community Shield win filled us all with optimism, then immediately plummets with the loss to West Ham. It rebounds a bit with a four match unbeaten run, and then things get really crazy. Arsenal then lost to Dinamo Zagreb and Chelsea in absurd fashion, but responded with a North London derby win and a 5-2 thumping of previously unbeaten Leicester, so the line rebounded a little bit. Oh, but then a damaging loss to Olympiacos in the Champions League causes the line to plummet again. Then, a stirring performance against an in-form Manchester United made everyone optimistic again. Anyway, Watford, they're in 12th. They've strung together some decent results this season, though they did crash out of the League Cup at the first hurdle to Preston North End. Their league losses were to Manchester City and Crystal Palace, which isn't too shabby. They've earned wins against Swansea (decent!) and Newcastle (who hasn't!) and nabbed road draws at Everton (okay!) and Bournemouth (also okay!) They've also had to settle for home draws against West Brom and Southampton, both 0-0 draws played in August. The Hornets have conceded only seven goals in league play this year, tying them for the best defensive record in the Premier League, with the likes of Arsenal, City, Palace, and Spurs. On the other hand, they've only scored six, tying them for the worst offensive record in the Premier League with West Brom and Newcastle. about that hilarious own goal he scored this week. 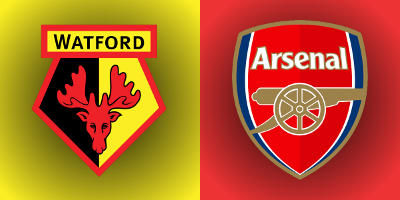 Arsenal have a mixed-to-mediocre record against Watford all-time; in their 16 league encounters, Watford have won eight of them and Arsenal have won seven, with one draw. Of course, those were almost all in the 1980's, leaving them not very relevant to this particular fixture. The Gunners have won five straight against the Hornets, though they have not met since Boxing Day in 2006, which I suppose also makes that statistic not very relevant to this particular fixture. In that match, a 2-1 Arsenal win, generic English-named forward Tommy Smith equalized for Watford after Gilberto Silva's opening goal; Robin van Persie won it for Arsenal in the 83rd. From 1982 to 1988, Watford spent six years in the top flight, during which they did the league double over Arsenal three times. The Hornets' last win over Arsenal came on April 15, 1988, 1-0 at Highbury. Watford had earlier won 2-0 at Vicarage Road on what was my first birthday, November 28, 1987. Watford finished 20th that season of 22 teams in the First Division; it is the only time Arsenal have ever lost twice to a side that was eventually relegated. The referee is Chester-based Mike Jones. This will be Jones's first Arsenal match of the season, though he has taken charge of one Watford match this year; that was their season opening 2-2 draw at Goodison Park against Everton. Last season, Arsenal had a record of three wins in three matches with Jones in charge, winning 3-0 at Aston Villa, 2-1 over Leicester City, and 2-1 at Newcastle United. Arsenal have won four straight with Jones in the middle overall, dating back to a 1-0 loss at Stoke in March of 2014, which the Potters won on a penalty. Watford are unbeaten in their last four with Jones in the middle, though that spans a very long period of time considering Jones's promotion to the Select Group in 2008. Watford's last loss with Jones in the middle was a 3-0 loss to West Bromwich Albion in a Championship fixture on November 3, 2007. John Painting is a contributing writer to the Modern Gooner and consistent fourth place finisher at pub trivia. You can follow him on Twitter @zorrocat to root for him the the pub trivia Champions League qualifier against Trabzonspor.